A Facebook message dredges up painful secrets from a woman’s past, one that she’s spent decades suppressing. London freelance interior designer Louise Williams works hard to maintain the life she’s built for herself and her 4-year-old son, Henry. Sure, she doesn’t have many friends and still wishes her ex-husband, Sam, hadn’t left her for another woman. But she’s still safe from her past deeds, which Marshall parcels out to the reader in dribs and drabs through halting flashbacks to Louise’s high school years at Sharne Bay in Norwich. Semipopular by association, the younger Louise stayed on the fringes, loosely tethered to the cool girls by her friendship with sleek Sophie Hannigan. When new girl Maria Weston arrives, Louise thinks the two could be friends. But nasty rumors follow Maria, making her undesirable to the popular clique, so much so that she’s shunned to the point of bullying. Then, on the night of an end-of-year party, things go too far and Maria disappears, presumed dead. 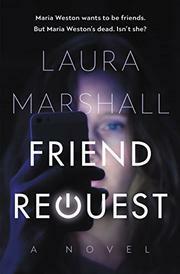 Louise takes this tragedy with her as she does everything possible to distance herself from Sharne Bay…until an unexpected Facebook friend request pops up, from Maria Weston. The virtual reappearance of Maria sends Louise into a tailspin as she tries to see if anyone else from Sharne Bay has been contacted. With a high school reunion coming up, Louise debates whether it’s worth attending and confronting her past head-on, as the messages from Maria become more threatening. The unveiling of Maria’s fate and the person or persons responsible is not much of a revelation given Marshall’s unfortunate habit of telegraphing plot twists. This debut suffers from a few too many clichés but contains important truths about the effects of peer pressure and bullying.